Hey there! Today’s new blog post is all about another quick and easy Instant Pot recipe! It’s deliciously sweet, savoury, creamy, and full of flavour! 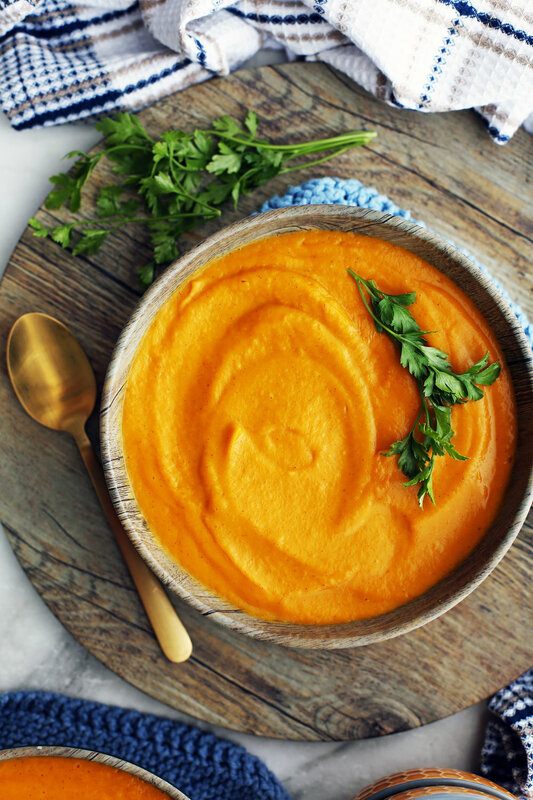 I hope you enjoy this recipe for: Instant Pot Sweet Potato Coconut Soup! All the ingredient in this ready for the Instant Pot. For complete ingredient amounts and instructions, scroll below for the recipe card. Sautéed onions, garlic, ginger, sweet potato, carrots, coconut milk, and spices ready to be cooked at high pressure. This is what it will look like after it is cooked at high pressure for 8 minutes and then for another 10 minutes of natural pressure release. Blend the mixture until it is smooth using either a high-powered blender or an immersion blender. What’s in this tasty soup? Sweet Potatoes are a starchy, sweet-tasting root vegetable with thin brown skin and colourful flesh on the inside – most commonly orange. However, you can also find varieties that have purple, white, or yellow flesh as well. For this recipe, I use the orange fleshed one. These sweet potatoes are good for you too. For example, one the biggest nutritional benefits is that they are high in beta-carotene, an antioxidant which converts into vitamin A when consumed. It is also a great source of vitamin C, manganese, and potassium. How to pick and store sweet potatoes? Choose sweet potatoes with smooth, firm, even-looking skin. Don’t pick ones with cracks, bruises or discolouration. Store raw sweet potatoes in a cool, dry place, but not in the refrigerator. Carrots are a root vegetable that's a kitchen ingredient staple for many households. Not only are they typically inexpensive and available year-round, these veggies are healthy. For example, they are a rich source of beta-carotene (like sweet potatoes), fiber, vitamin K, and potassium, which can help with lowering cholesterol levels and maintaining healthy vision. Look for firm carrots with bright orange (or purple, red, white, or yellow) color and smooth, crisp skin. Avoid carrots if they are limp, cracked, or black near the tops. Store carrots by trimming off the green leaves, placing them in a container filled with water, sealing them with a lid, and then storing in the refrigerator. Change out the water when it becomes cloudy, every 3-5 days. Coconut milk is added to the sweet vegetables to bring a delicious coconut flavour that’s slightly nutty. This is also a great vegan alternative to using regular (cow’s) milk or cream. The aromatic combination of onion, garlic, and ginger along with the warming spices, which include cinnamon, cardamom, and cumin adds amazing flavour that’s sweet, savoury, zingy, and lightly spicy. Perfect to go with the orange vegetables in this yummy soup. Once sautéed and pressure cooked, all these ingredients are pureed together to create one delicious, silky, thick soup! Looking for more Instant Pot Soups? Take a look at these ones! The orange shade of soup is different based on the lighting and how the camera picks it up. Filling and satisfying, but doesn’t feel heavy. Simple and easy to make: everything is made in the Instant Pot. Plentiful as it makes a good amount of soup: between 7 and 8 cups! Great to have as leftovers: It tastes just as good the next day or two. Vegan and gluten-free: Perfect for those with these dietary restrictions. Set the Instant Pot to "sauté". Add the olive oil and onion to the pot, stirring until softened, about 3-4 minutes. Add in the garlic and ginger and stir for another minute. Press “cancel” to turn off the Instant Pot. Add the remaining ingredients: sweet potatoes, carrots, spices (including salt and pepper), coconut milk, and water to the pot. Give the mixture a good stir to distribute the ingredients. Seal the Instant Pot and cook at high pressure (“manual”/"pressure cook" function) for 8 minutes. After it is ready, allow natural pressure release for 10 minutes before applying a quick pressure release to completely depressurize (until floating valve drops). Open the Instant Pot and give the soup a stir *(see first note). Using an immersion blender or high-powered blender **(see second note), blend the soup until it is completely smooth. Taste for additional salt and pepper (or other seasonings). Best served immediately. *If you find that there is too much liquid in the pot, carefully ladle out excess liquid before blending. You can always add it back in to thin out the soup if needed. **If you are using a blender, blend in small batches. Careful as the soup is hot and it may splatter. Makes 7-8 cups. Nutritional calories represent one serving with eight servings total.